Number 995, of 1001 Albums You Must Listen to Before you Die. I’ve been avoiding this record because I just don’t have much to say about it. In the Wee Small Hours surprised me with smoky atmospheres and heart-on-your-sleeve emotions, but Songs for Swingin’ Lovers! is a cheesy butterball of everything that puts me off Frank Sinatra. Sure, songs like I’ve got you Under my Skin and Anything Goes are bucket loads of fun to perform at karaoke, when you can pretend you’re a cigar smoking, whiskey sipping womaniser in a pie hat. But where’s the substance? Tagged 1001 Albums, Frank Sinatra, Songs for Swingin' Lovers! This blog has been feeling a bit stale, and for years I’ve wanted to trawl my way through the epic ‘1001 Albums you Must Hear Before you Die‘. There’s so much musical history that I’m unfamiliar with, so many genres I’ve never explored and quite frankly looked down upon, but I figure it’s time to grow up a bit. I needed a guide and this book seems like a good place to start. So, faithful reader, you’re coming on this journey with me. If you can be bothered reading along, that is. I may not end up listening to, or reviewing, all 1001 albums but it’ll be fun to try. I don’t plan on giving up my more experimental leanings either. In fact, I expect one to inspire my thoughts and interest in the other. If you want to play along, I’m using the 2013 edition with Joy Division’s Unkown Pleasures on the cover. First off the gates is ol’ Blue Eyes and what many call the first ever ‘album’. They say that prior to In the Wee Small Hours’ release the lp was merely a way to collect an artist’s (of group of artists’) 45″ singles onto one disc. Sinatra and his collaborators wanted to approach the lp as a singular entity, taking the listener on a sonic journey through a particular mood. A collection of songs that worked together rather than a bunch of mismatched singles jammed together. Perhaps we can think of this as the original ‘concept record’. And, as with 90% of pop music the concept here is a broken heart. Specifically Sinatra’s broken heart. After a messy divorce, and with a second marriage on the rocks, In the Wee Small Hours is the sound of a man fucked up on love. Sinatra’s gentle croon, and some stunning string arrangements by Nelson Riddle (who worked with all the greats of the time, apparently), give the record a smooth and dreamy surface. Pay attention to the lyrics, though, and you’ll hear a man struggling under the weight of lost love, depression and lonely night life experiences. The cover art – Sinatra alone, under a street lamp looking forlorn – sets the scene beautifully. Nothing about this record is ‘New York! New York!’ and that’s probably why I’ve fallen for it. This is exactly the sort of surprise I was hoping to encounter by working my way through the 1001 and albums. 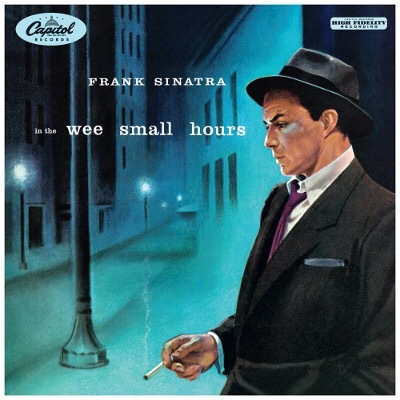 In the Wee Small Hours is a beautiful record completely opposed to my preconceptions of Frank Sinatra as a schlocky front man for boisterous Big Bands on the Las Vegas strip.